This is a tad late (halfway through the month already?! ), but today I’m sharing with you my lovely roundup of things that I’m currently coveting for the month of June. I have another busy catch-up week ahead, so I’m just going to let the items do the talking! 1. So Well Composed Pen Set (Kate Spade)- Every self-proclaimed KSNY girl needs a set of these pens in her arsenal. I mean, just look at them, they’re so quirky and utterly perfect. 2. Kitschy Faux Stone Cocktail Ring (Forever 21)- I apparently have an affection for this kitschy floral design...back in April, I spotlighted the exact same necklace version of this ring. It was from Forever 21, too! 3. Cotton Piqué Short in Gemstone Print (J.Crew)- With the official arrival of summer so close, I can’t help but want every pair of shorts in sight. It’s safe to say that J.Crew is a top-contender for some of the season’s best shorts options. Besides this gemstone printed pair, I also have my eye on these polka dots and these chambray sailboats. 6. Saline Sunglasses (Westward Leaning x Olivia Palermo)- I’m currently obsessed with Olivia Palermo’s sunglass collaboration with Westward Leaning. Normally one to gravitate toward either black or tortoiseshell sunnies, I surprised myself by instantly falling for this “matte frost” pair. 7. Blanket Cut Out Dress (Tibi)- The stripes featured in this Tibi dress are super cute, right? Available in cactus green and pale blush, the colors could not be more spot-on. AND those sweet side cutouts – just perfect! 8. Shine Stripe T-Shirt (aerie)- Whoever dubbed lightweight tees as boring and basic is surely mistaken. This one from aerie is so nonchalant and effortless that it’s meant to be tucked and tied for simplicity sake. 10. The Grass is Always Greener Large Notebook (Kate Spade)- In classic Kate Spade kelly green, this notebook makes me want to handwrite everything – who needs a laptop anyway?! 11. Maison Kitsuné Stripe Skater Skirt (J.Crew)- Fact: There are few color combinations more Parisian than navy + cream. Whether paired with a chambray shirt or lightweight sweater/sweatshirt at dusk, this stripe skater girl has “cool girl” written all over it. 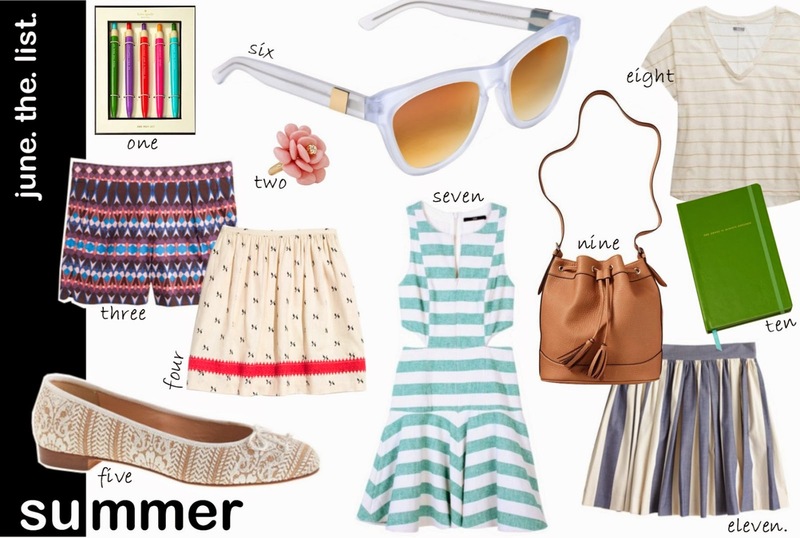 What summer must-haves are on your list? Loveee the printed shorts and flats!